This pick-up and clean-up tool is great for use in the home and around the yard. Extend your reach,avoid repeated bending and stretching to get out of reach items. It also provides help for the physically disabled. This is a must have for anyone who needs a helping hand and wants less back strain. - Size: 79.5x11.7x12.3cm / 31.3x4.6x4.8inch. 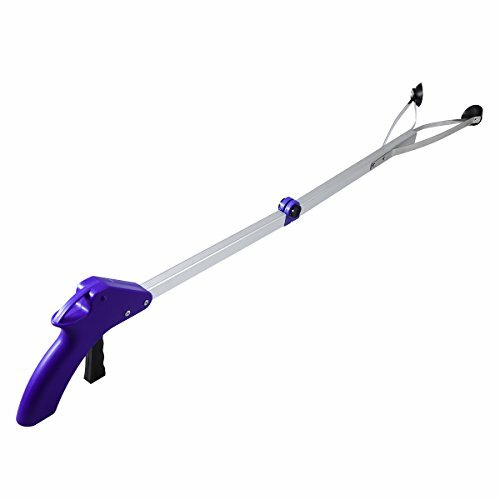 - Grabber tool, this Pick Up Reaching Claw is the perfect multi-purpose item for whenever you may need a helping hand. - Extend your reach, avoid repeated bending and stretching to get out of reach items. - Turn off switch on the handle, the object can be saved, being held or released, folds for easy storage anywhere. - For people with disabilities, to use a wheelchair, the elderly and disabled persons work life good helper. Material: Aluminium alloy. Size: 79.5x11.7x12.3cm / 31.3x4.6x4.8inch. Grabber tool, this Pick Up Reaching Claw is the perfect multi-purpose item for whenever you may need a helping hand. Extend your reach, avoid repeated bending and stretching to get out of reach items. Turn off switch on the handle, the object can be saved, being held or released, folds for easy storage anywhere. For people with disabilities, to use a wheelchair, the elderly and disabled persons work life good helper. If you have any questions about this product by BESTOMZ, contact us by completing and submitting the form below. If you are looking for a specif part number, please include it with your message.